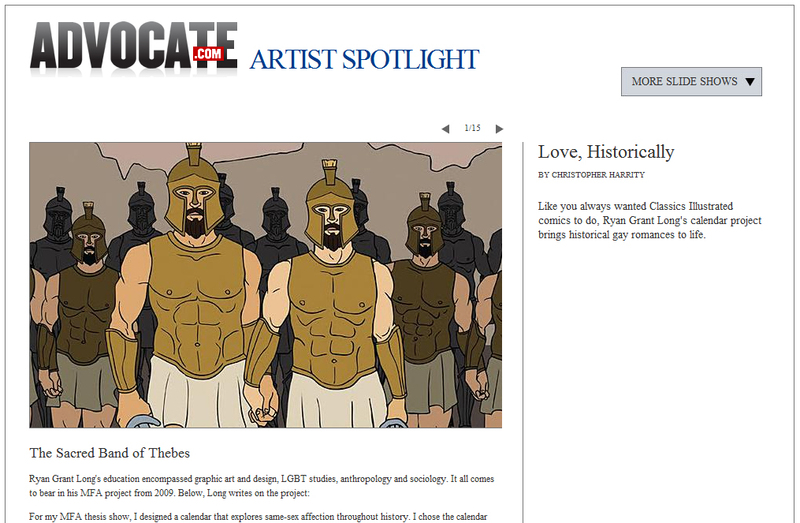 Very excited that The Advocate featured my MFA project on their website! Quite the honor. I also really love how they worded the short intro they included: “Like you always wanted Classics Illustrated comics to do…” Absolutely! Aesthetically, I wanted to give gay people the same kinds of generic, stereotypical romantic images and tropes that straight people grow up with and take for granted. I researched comic books, romance novel covers and movie posters to get most of these poses. The calendar is still on sale in a slightly modified version on deviantART. The year will automatically change in July to the next year. Example: If you submit a Calendar for the year 2013 before the end of December 2012, the Calendar will automatically change to the year 2014 in July 2013. We currently ship calendars for the year 2013. I was interviewed by a LGBT-affirming spiritual blog called Jesus in Love, regarding the calendar illustrations I created for my MFA degree. The full calendar is available for purchase on my deviantART page.